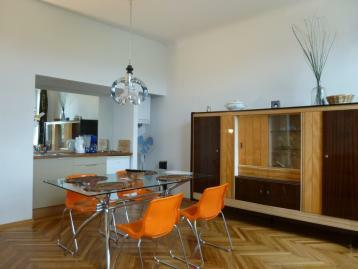 3 BR 2 bath apartment in the center of Vienna. The apartment has 2 entrances from the public hallway - next to each other. One leads to 2 bedrooms and living room, the other to 3rd BR and add'l bath. The separate bedroom has a king size bed and a convertible couch, the 2 BRs have a queen size bed each and there is a convertible couch in the living room. All but one BR face the park (one BR faces the hallway). The apartment is situated on the top floor a Jugenstil building (new elevator 5/14). The building faces a quiet park with views of trees and the Prater in the distance, above the rooftops. inquire | location | video | facts | book online!